Finding a healthy toothpaste can be such a challenge! I have spent hours browsing the dental aisle shelves at big box stores and health food markets alike, trying to find a suitable toothpaste for my family. I wanted a fluoride free toothpaste, one without artificial ingredients, plastic microbeads, or chemical compounds. There were none to be found! Even the natural toothpastes generally contained glycerin and fluoride, both ingredients that I did not want going in our mouths or on our teeth. 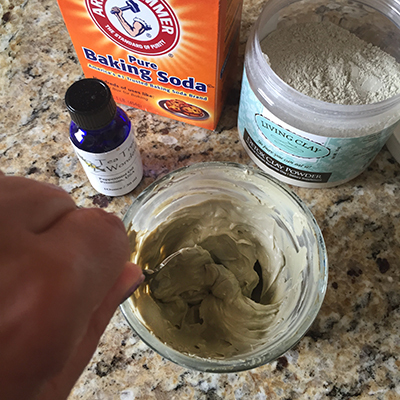 Today we have a wonderful remineralizing homemade toothpaste recipe (below) made from detoxifying bentonite clay. Making your own natural toothpaste not only saves you money but also ensures that only the safest, best ingredients come in contact with your body. Commercial toothpastes — including most of the natural ones — contain many questionable and even toxic ingredients. The Physician’s Desk Reference states that the oral cavity has an absorption rate of greater than 90 percent, which means nearly all of those chemicals on your toothbrush are going straight into your bloodstream. Sodium Fluoride: Last year, the Lancet finally officially declared fluoride a neurotoxin. In fact, fluoride is one of the main ingredients in rat poison and pesticides. Toothpastes have warning labels on them to avoid swallowing and not to use for young children. Just one tube of toothpaste could contain enough fluoride to kill a small child. Studies have found that fluoride does not necessarily prevent cavities or decay, and may lead to fluorosis (white areas on teeth), nausea and vomiting, diarrhea, allergic reaction, arthritis, and cancer. Fluoride is not even FDA approved. Sodium Lauryl Sulfate: Sodium lauryl sulfate (SLS) is a foaming agent that is corrosive and irritates and damages skin tissue. It is often used in animal studies to induce skin irritation so that they can see how well healing compounds work. Sodium lauryl sulfate accumulates in vital organs and can become carcinogenic when combined with certain other chemicals. SLS is also linked to canker sores. Artificial Colors: Dyes such as FD&C Blue Dyes 1 & 2 may cause behavioral, learning, and health problems. They can also irritate the respiratory and digestive tracts. Propylene Glycol: This chemical is used in antifreeze and workers handling propylene glycol are required by the EPA to wear protective gloves. Propylene glycol can cause gastrointestinal problems, harm skin cells, damage the kidneys, liver, and brain, and depress the central nervous system. Triclosan: An antimicrobial clorophenol, Triclosan disrupts hormone and thyroid function and can cause cold sweats, circulatory collapse, cancer, convulsions, coma, and death. It is classified by the EPA as a pesticide. It also has damaging effects on the environment. Hydrated Silica: Hydrated silica is highly abrasive and can damage tooth enamel. Glycerin: Found in even most natural toothpastes, glycerin creates a coating on the teeth that takes 27 brushings to wash off. This coating can prevent mineral absorption, interfering with the natural remineralization process of the teeth. By making homemade toothpaste, you have complete control over the ingredients and can avoid these chemicals and improve your dental health. The bentonite clay in this homemade toothpaste draws out toxins, reduces oral bacteria, remineralizes the teeth, and whitens and brightens. Since it is a mild abrasive, it is great for scrubbing teeth clean, but won’t wear down enamel. Bentonite clay is alkaline, so it neutralizes the acids that can contribute to enamel erosion. 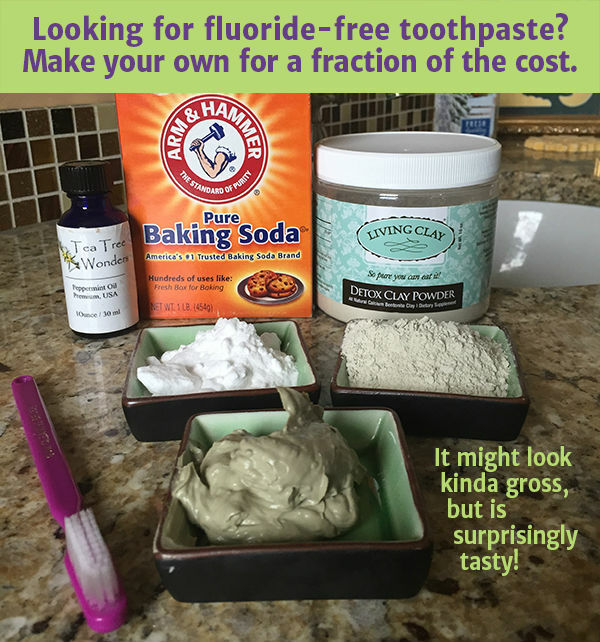 The baking soda, too, in this homemade toothpaste helps neutralize acid and removes surface stains. Stevia adds a sweetness to this homemade toothpaste and inhibits bacterial growth that can lead to tooth decay and gum disease. Flavor is imparted with essential oils that provide great health benefits and none of the risks of artificial flavorings or sweeteners. This homemade toothpaste is that it is very safe — all of the ingredients are edible, so it is safe to swallow, fluoride free, and therefore perfect even for young children. Simply mix up the ingredients and store your homemade toothpaste in a sealed glass jar. Avoid plastic, since bentonite clay absorbs toxins that are in most plastics. Also avoid metal, since hydrated bentonite clay is electromagnetic and can cause rust and deterioration of metals left in contact with it, as well as decrease the clay’s effectiveness. Brushing your teeth with bentonite clay toothpaste is a little different than using commercial toothpaste. For one, it does not foam up — but that doesn’t mean it isn’t cleaning! In fact, the foaming agents usually added to toothpastes are toxic, and only give the impression of cleaning efficacy. It’s also a little strange at first to spit brown toothpaste into your sink, but remember that this is a homemade toothpaste from the earth that doesn’t contain the dangerous whitening agents and artificial colors of other toothpastes. Combine with purified water a tablespoon at a time until it reaches a good paste consistency. Store in a glass (not plastic or metal!) jar. You can simply dip your toothbrush into the jar. Or, use a small spoon, knife, or popsicle stick to spread your toothpaste onto your brush. Brush teeth as usual. Spit out or swallow, whichever you prefer. Also consider adding oil pulling with coconut oil to your daily oral care regime to further improve dental hygiene and whiten teeth. Substitute the peppermint with other essential oils for some variety. I love lemon essential oil in mine. Cinnamon oil is another fun option. Children may enjoy orange or vanilla essential oils. The great thing about homemade toothpaste is that you can flavor it exactly as you like! You can use xylitol in place of stevia, as xylitol helps kill bacteria, prevents cavities, and remineralizes enamel. Since xylitol is not as sweet as liquid stevia, you will need to adjust the amount to taste. Try about 1/2 cup xylitol to start. If you tend to have a lot of toothaches or infections, add some ground cloves or clove oil to your homemade toothpaste. Cloves are a natural analgesic — relieving tooth pain — plus they are antimicrobial to combat infection.